PEVELY, Mo. - Aug. 5, 2016 - Neither rain nor restarts could dampen David Gravel's Friday night as he dominated the Monroe Shocks and Struts Prelude to the Ironman at Federated Auto Parts Raceway at I-55 and scored his second straight and seventh overall World of Outlaws Craftsman® Sprint Car Series victory of the season. Off-and-on light rain fell on the 1/3 mile, bullring in Pevely, Mo. throughout the feature, but Gravel was the class of the field in his No. 5 Big Game Treestands machine. Multiple restarts hit in the middle of the 35-lap main event, but Gravel held off the competition behind and cruised to the finish. He has led the last 75 laps of World of Outlaws competition. "We're really rolling right now," Gravel said in victory lane. "It was a really fast race track around the top and the rain made the top even better and tighter as the race went on… We've won a rain-shortened race so you don't want to get too many of those. You want to earn them. You needed that 35-lap workout because 55 laps tomorrow is going to be tough, for sure." Brad Sweet helped kick off the night by claiming his 10th quick time award, for being the fastest qualifier, this season. He and Joey Saldana are now tied for the most in 2016. Gravel was the beneficiary of the Dash inversion draw and started on the Dash pole next to Jacob Allen. The two drivers finished first and second and started in the same positions in the feature. When the green flag waved, Gravel quickly built up a lead as Allen held off Donny Schatz. When Gravel caught the tail end of the field, he had 1.5 second lead. The first caution flag of the night flew on lap 9 as James McFadden spun through turns one and two. On the restart, Gravel jumped forward, but the next five positions behind jumbled up as Allen and Sweet made contact, opening the door for Donny Schatz and Daryn Pittman. Schatz quickly took over second as Pittman battled Allen side-by-side through turns one and two and took over third as they entered on to the back straight. Through a spate of cautions in the middle of the feature, Daryn Pittman, who nearly lost third to his Kasey Kahne Racing with Mike Curb teammate, Brad Sweet, battled past Schatz for second as Sweet and Schatz engaged in a multi-lap battle for the third position. "Once Donny took a few slide jobs at me and I got my momentum going and cleared him," Sweet said. "I'm sure he was right there with me, but there wasn't much you could do with the lapped cars on the bottom." Sweet eventually took over the position in his No. 49 Ollies Bargain Outlet car. Through the closing laps, Pittman tried to find a line around Gravel in his No. 9 Great Clips car but was only able to slightly lessen the gap. Gravel, Pittman and Sweet all now have seven wins on the season. Gravel sits second in the championship standings, 235 points out of the lead. "Just glad to hang on," Gravel said. "I've got to thank (my crew) Barry, Derek and Austin, they do a great job, (my CJB Motorsports team owners) Chad and Jenn Clemens for this opportunity. It's been an awesome season. Hopefully, we can keep doing what we're doing." Pittman said the restarts were key throughout the night - for him the most consequential was the first one that helped him into the podium positions. "We got a good restart there on Donny and we were lucky - we had a lot of breaks go our way tonight," Pittmans said. "We had a restart where I started sixth and got to third on that one, so that helped a ton. I thought I actually had a shot on Gravel, but didn't feel like I had him cleared so I had to leave him some room. Good effort by my guys and a good finish for us." Sweet said Schatz made it challenging through the middle portion of the race but once he got on the high line, he felt good about his position. "There were a lot of restarts. It was just a matter of some worked for me and some didn't," Sweet said. "If we had anymore yellows or lapped traffic to get in the way of Daryn and David for us to have a shot at them - just a tricky, rough track. Glad we came out in third. We'll come back tomorrow and hopefully run a good 55 laps." The World of Outlaws Craftsman Sprint Car Series returns to action Saturday at Federated Auto Parts Raceway at I-55 for the $20,000-to-win, Federated Auto Parts Ironman 55 presented by Walker. 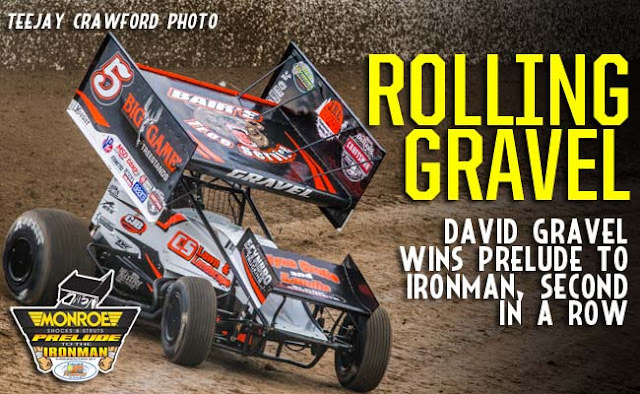 For more information and to learn how to purchase tickets, visit WoOSprint.com/Ironman-55. RACE NOTES: David Gravel has led the last 75 laps of World of Outlaws competition. He has two straight wins where he led flag-to-flag… Brad Loyet was the night's KSE Racing Hard Charger, advancing 10 positions to finish in 10th… All three of the night's podium finishers, David Gravel, Daryn Pittman and Brad Sweet all have seven wins… Brad Sweet and Joey Saldana are now tied for the most quick time awards this season with 10 apiece. CONTINGENCY WINNERS - MSD Ignitions ($25 cash): Paul McMahan; MSD Ignitions ($50 cash): David Gravel; Penske Shocks ($50 cash): Donny Schatz; JE Pistons ($50 cash): Jason Johnson; VP Racing Fuels ($50 cash): Joey Saldana; Edelbrock ($50 cash): Joey Saldana; Comp Cams ($50 cash): Jacob Allen; Morton Buildings ($50 cash): Jacob Allen; Cometic Gasket ($50 cash): Logan Schuchart; Super Flow ($50 cash): Jason Sides; Craftsman/Sears ($100 cash): Parker Price-Miller; KSE Racing Products ($100 product certificate): Brad Loyet; Comp Cams ($50 product certificate): David Gravel; JE Pistons (Set of Rings): Greg Wilson; JE Pistons (Set of Rings): Brent Marks. SEASON WINNERS: Donny Schatz - 16 (Volusia Speedway Park on Feb. 14, The Dirt Track at Las Vegas on March 4, Stockton Dirt Track on March 18, Stockton Dirt Track on March 19, Silver Dollar Speedway on April 2, Lincoln Speedway on May 19, Weedsport Speedway on May 22, Lincoln Park Speedway on June 8, Knoxville Raceway on June 11, River Cities Speedway on June 17, Rockford Speedway on June 29, Badlands Motor Speedway on July 3, Cedar Lake Speedway on July 9, Attica Raceway Park on July 12, Eldora Speedway on July 16, Ohsweken Speedway on July 26); David Gravel - 7 (Thunderbowl Raceway on March 12, Tri-State Speedway on May 14, I-96 Speedway on June 6, Eldora Speedway on July 14, Lernerville Speedway on July 19, Wilmot Raceway on July 30, Federated Auto Parts Raceway at I-55 on Aug. 5); Daryn Pittman - 7 (Royal Purple Raceway on Feb. 27, Perris Auto Speedway on April 16, USA Raceway on April 18, New Egypt Speedway on May 24, Jackson Motorplex on June 24, Eldora Speedway on July 15, Williams Grove Speedway on July 22); Brad Sweet - 7 (Volusia Speedway Park on Feb. 13, Volusia Speedway Park on Feb. 14, Cotton Bowl Speedway on Feb. 26, Ocean Speedway on April 1, Bakersfield Speedway on April 15, Plymouth Speedway on May 13, Badlands Motor Speedway on July 2); Shane Stewart - 5 (Arizona Speedway on March 6, Devil's Bowl Speedway on April 23, Lawrenceburg Speedway on May 30, Granite City Speedway on June 15, Brown County Speedway on June 19); Joey Saldana - 4 (The Dirt Track at Las Vegas on March 3, Devil's Bowl Speedway on April 22, Jacksonville Speedway on May 4, I-80 Speedway on June 22); Lance Dewease - 2 (Williams Grove Speedway on May 20, Williams Grove Speedway on July 23); Kerry Madsen - 2 (Eldora Speedway on May 6 and 7);Bill Balog - 1 (Beaver Dam Raceway on June 25); Chad Kemenah - 1 (Fremont Speedway on June 3); Jason Johnson - 1 (Placerville Speedway on March 24); Terry McCarl - 1 (Knoxville Raceway on June 10);Logan Schuchart - 1 (Cedar Lake Speedway on July 9); Jason Sides - 1 (I-30 Speedway on April 26); Greg Wilson - 1 (The Dirt Track at Charlotte on May 27).